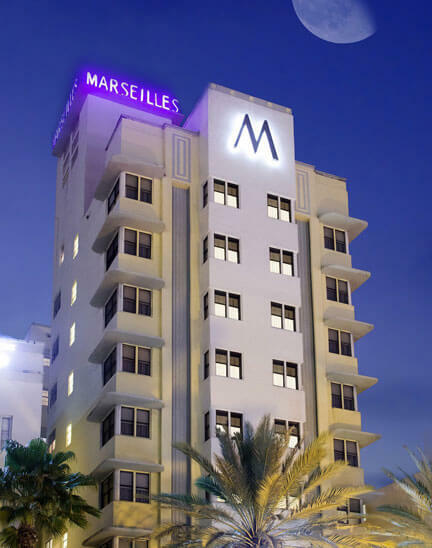 The Marseilles Hotel is located on the ocean side of Collins Avenue in Miami Beach’s scenic art deco district. A couple of blocks from the Convention Center, Ocean Drive and the Lincoln Road Mall, you’ll find Miami’s finest shopping, dining, and nightlife just steps from your front door. Get up close and personal with all the fun and wildness that South Beach has to offer. And when you’re ready to escape the glitz and glitter of South Beach, tuck yourself into the comforts of your room or enjoy the tropical oasis that awaits you out back. Bask in the sun, swing in a hammock, or swim in the ocean. Unwind on a lounge in our private beach area or enjoy exclusive access to our new poolside sundeck and furnished cabanas. There’s no better place to catch a tan, people watch, and sip mojitos. So relax, renew and let us make your stay at our Miami Beach oceanfront hotel one to remember.